I just got home from a beautiful hike with a friend in Redwood Regional Park. I always love Thanksgiving weekend as it seems to be one of the rare times that life truly slows down. Being out in the woods on this crisp sunny day inspired me to share this autumnal wedding in Hopland, California. This is the same wedding that I spoke of in last month’s post – Fall Wedding Feast. This project drew inspiration from Northern California’s natural landscape, John Muir’s botanical collection, and early American folk art. 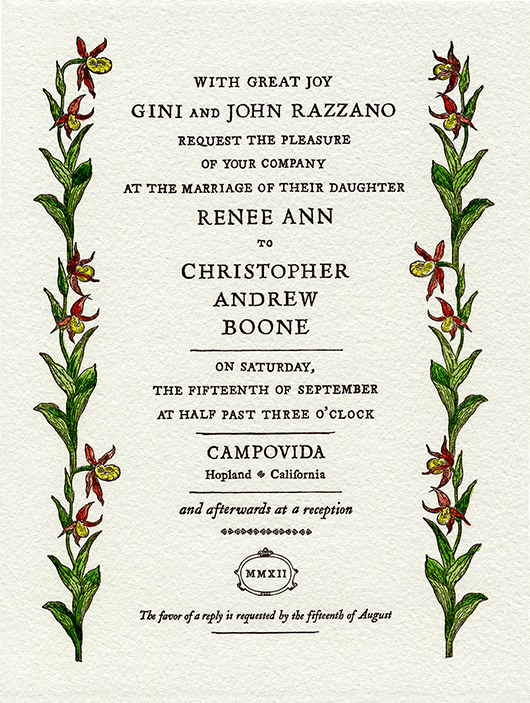 Lady’s slipper orchids were especially significant to the bride and groom, and therefore, became a main feature on their invitation (above & below). 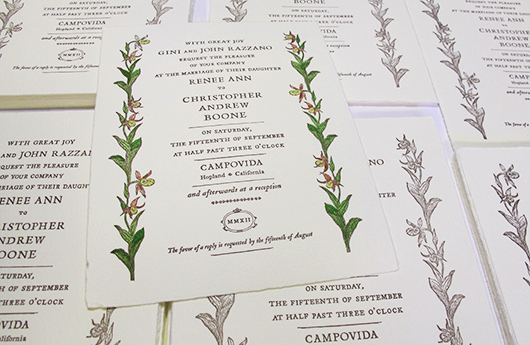 I letterpress printed my hand-lettering and the line work of the Lady’s slipper botanical illustration. I then hand-painted each invitation with watercolor and gouache, a lot of work but it really made the imagery come to life. Here is the invitation for the rehearsal/welcome dinner held the night before the wedding. For this invitation I looked to early American folk art, especially Pennsylvania Dutch and the paper-cut crafts of the time. 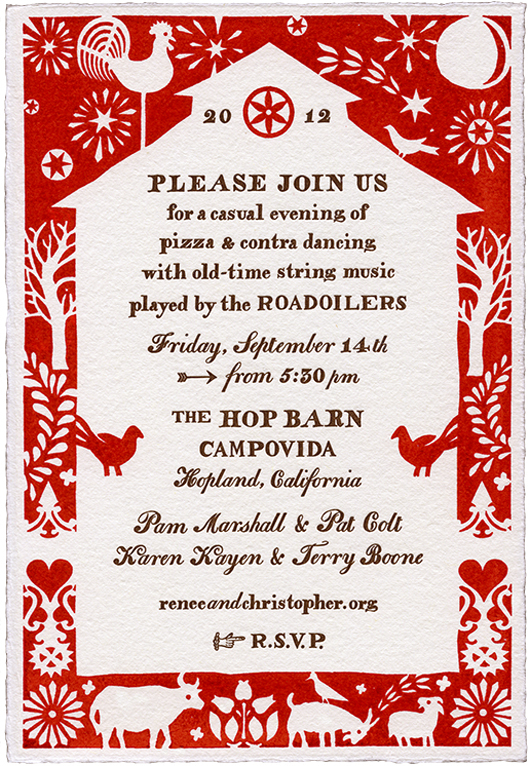 The event was held in the hop barn, at Campovida, and so I thought it would be fun to have the invitation wording displayed within the silhouette shape of the barn. My hand-lettering is inspired by old Shaker alphabets and painted signs. 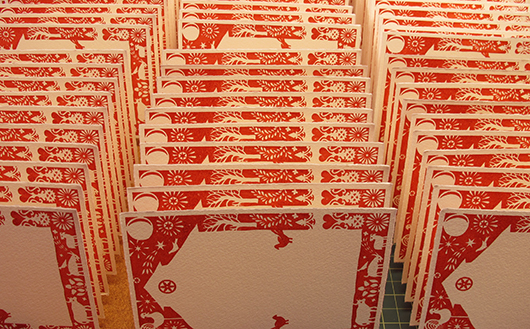 I silkscreen printed my illustrations in bright ‘barn red’ and letterpress printed the wording. Campovida is a working family run farm so it seemed fitting to include the farm animals in my design. I love the mixture of traditional folk art symbols, the rooster weather vane, and the firework-like stars in the sky. The invitations were packaged in these beautiful envelopes. I printed a pressed plant image of a violet, with heart shaped leaves that draped over the front. 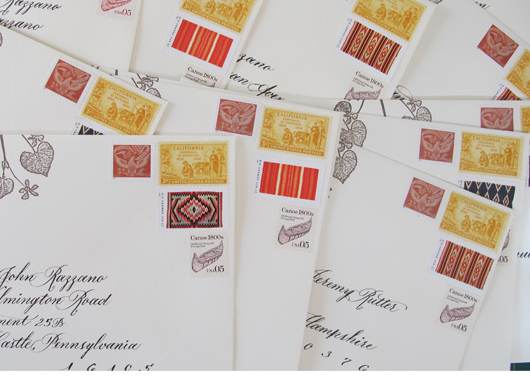 The bride and groom found the perfect vintage postage stamps which added such autumnal color and personality to the presentation. The stunning calligraphy of the addresses was done by Adrienne Keats. I hope everyone is enjoying their Thanksgiving holiday, staying warm and cozy, and finding time for a little walk in the woods.